I eat my peas with honey, I've done it all my life. It makes the peas taste funny but it keeps them on the knife. But why is the mayor attacking me!? 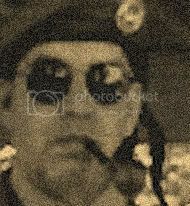 I occasionally wear the monocle I wear in my avatar image with regular garb. I also have a tendency to use outdated language in everyday conversation. There are holes in the sky where the rain gets in. But they're ever so small, that's why rain is thin. cakes that look nothing like cakes make me happy. I love pastry subterfuge! What about things that aren't cakes looking like cakes? It's a meatloaf, that looks like a cake! Brilliant! Mashed-potato frosting, no doubt? I'm less clear on what the glaze might be, unless it's a heavily-reduced demi-glace? For eccentric cookery, you should investigate Bob "Surreal Gourmet" Blumer, notable for pound-cake "french fries" with raspberry coulis "katsup" and for making bacon & eggs, sunny-side up out of meringue, canned apricots and two-tone chocolate. I intend to appempt a meat cake for my husband's Birthday in July. It will the next of my evil cakes. Most odd. I saw the picture first and thought 'that looks a nice cake'. Then I noticed it's made of meat and yet still think it looks appetizing. Usually I'm quite a finicky eater. Ketchup was my first thought, but it seemed a little more translucent than I would have expected. On the other hand, my mother does a ketchup-based meatloaf glaze that isn't too far off what's pictured. I only considered yesterday, but it strikes me as odd how often I like to go out for a ramble, usually twice or thrice a week. It lets me clear my head for some reason. If I didn't I'd probably talk to myself a lot more than I already do. My dear Mr. Harrison, there is absolutely nothing wrong in talking to oneself. Even the occasional rousing argument is not in the least amiss. Why anyone would want to be considered "normal" is beyond me... especially when I see what "normal" people are like. Just about anything can be made palatable with the right combination of herbs and spices... except escargot, beets and pickled pigs' knuckles. 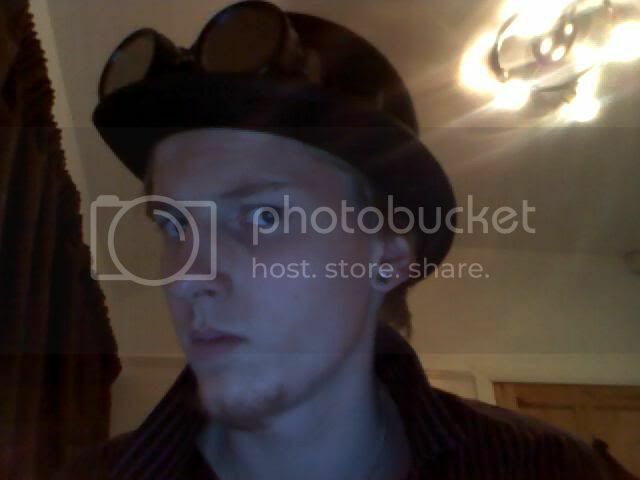 anyone wanting to stand out in a victorian/steam-powered manor. ...is a Victorian manor, and is for the most part steam-powered, what with the stationary engine powering the new-fangled Edison bulbs, though there are still a few gas-lamps around here and there. When it comes to standing out, however, mostly I stand out in the yard. QUICK! CALL THE AUTHORITIES! SOMEONE'S RAMMED THE ADDAMS' HOUSE INTO THE MUNSTER's HOUSE!!! That is what I call a "Des Res"! That is an outstanding house Sir. Indeed, Thistlewaite Manor is quite lovely! As far as eccentricity is concerned, a friend and I have been known, in public, to greet one another and carry on conversations comprised only of phrases plucked from historical church services. Singing the appropriate bits and including all of the liturgical "dance steps", as it were. The looks one gets for singing the Magnificat in a chemist's shop - you'd think people had never heard it before! I ain't eccentric, I just like the thread. ...which I seem to have killed... Say, does anybody have spare batteries for a portable aetherphone handy?